Fun Days for Heritage Detectives - The website of the heritage knights! Go West Heritage Knights hold workshops for young heritage detectives. Here is an example of what can happen. 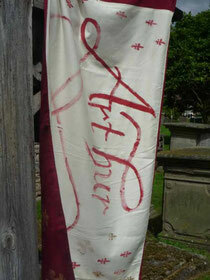 For more detail about the workshops we can offer please click on the side panel. The scene is set- something strange happened! A week before the Fun Day a mysterious box and bag of treasures appeared in the hall of Norton-juxta-Kempsey First School (Norton). 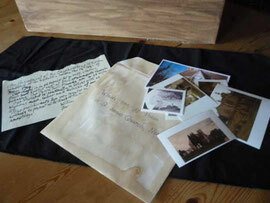 Inside the box were old documents - scrolls, old maps and photographs and an ancient notebook with a letter from a stranger who seemed to be travelling through time collecting information about places in Worcestershire. He was looking for things in Worcestershire today that his friend Arthur de Caldicot (b.1187) might recognise if he were to time travel to Worcestershire today. Some of the papers might be to do with Norton, could anyone help him confirm this? Well the children were happy to help but first they needed to develop their heritage detective skills. The Heritage Knights were brought in to help. The Heritage Knights were called. 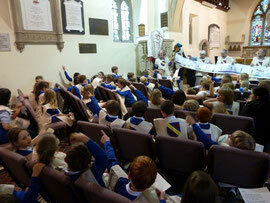 The Heritage Knights planned a day in the local church; its long history meant that the children could learn the skills of the heritage detective and start to find answers for the mysterious stranger. During the day the young heritage detectives were introduced to the tools of the detectives' trade and learned about timelines, wonder points and wonder cards. 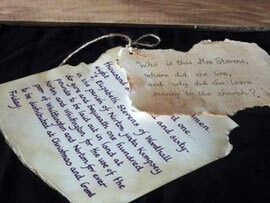 Four workshops were organised, each one picked up on the clues that the stranger had left in the Treasure Box. Each workshop needed to be repeated four times during the day to ensure that every child took part in every workshop. The sessions were run by volunteers they were retired teachers. It was July 2012 and about 60 children from Years 3 & 4 were expected. It turned out to be a VERY WET day, it rained and it rained all day. Fortunately we had made plans to cope with this but everyone needed to speak from the same hymn sheet if we were to avoid the wet slippery floors we had indentified in our Risk Assessment! LEARNING POINT Anticpate! Make plans for many different scenarios and then make sure that everyone is well briefed, including your visitors, teachers and pupils. 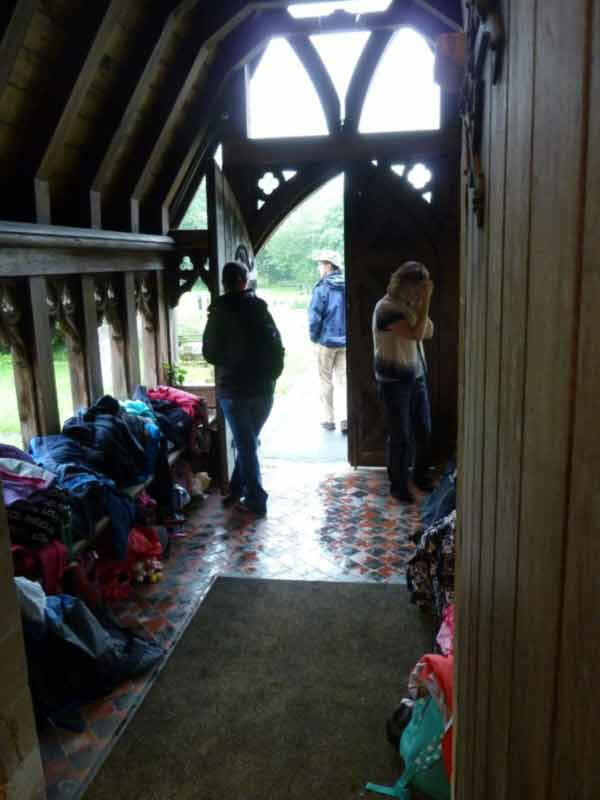 We were still setting up when some of the children arrived, they were dropped off by parents first thing in the morning. Fortunately we had somewhere for them to sit and there was plenty going on to look at. We asked the teachers to help us give out copies of the words of our songs etc. Give yourselves plenty of time. Plan things to start much earlier than you think and then don't be surprised if they don't! Music and song play an important part in all Heritage Knights celebrations. 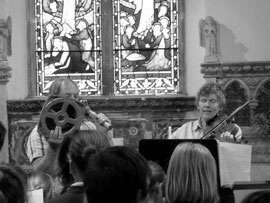 Singing sessions punctuate workshops for heritage detectives. The day opened with music. 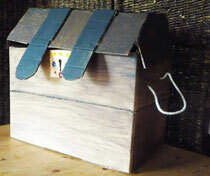 The workshops were designed to use the clues and answer the questions the children had found in the treasures box so mysteriously left in their school hall. There were 15 children in each workshop. Each workshop lasted 50 minutes and was resourced and run by retired teachers. The children were accompanied by their teachers who remained responsible for them at all times. Norton is just a small part of the parish of Norton-juxta-Kemspey. 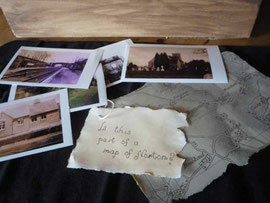 In this workshop the children were on a quest to discover if a map found in the Treasures Box is part of an old map of the parish of Norton-juxta-Kemspey. 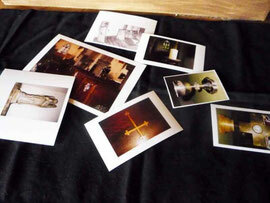 Which of these old photos of churches is Norton Church? The parish church has nearly fallen down many times, there is an old photograph showing the west end propped up. Over the centuries Norton people have built it up again and improved it. The children were on a quest to look for clues to discover the age of the building, the window shapes will help them! The curate/vicar of this church has always had a responsibility to care for the people who live in the parish. The quest for this workshop was to find out why people have cared for this building for so long. Thousands of people have/do consider this building, its churchyard and its contents to be special, even sacred. The quest here was to discover if there is something significant in this place for today's children. 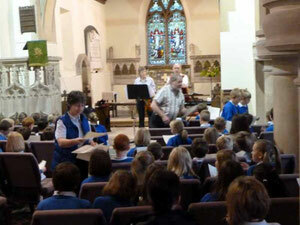 Parents and carers joined in the final celebrations, singing the Song of the Year and the Worcesters Gloria. For a more detailed account of each of the workshops use the links below. The Heritage knights received some thoughtful and illuminating 'thank you' letters from the children. Perhaps the best piece of feedback came when one of the workshop leaders met a mother in the street some weeks later. She reported that ever since 'that day in the church' her son had been looking at everything, wanting to know about it and how old it was!